The Hameau’s team welcomes this achievement with great pride and joy, as well as the arrival of the new chef, Christophe Chiavola. He will keep on showcasing the Alpilles culinary wonders in this one-of-a-kind, charming village-like 5 stars hotel, located just a throw’s stone away from Les Baux de Provence and 15 minutes away from Arles. 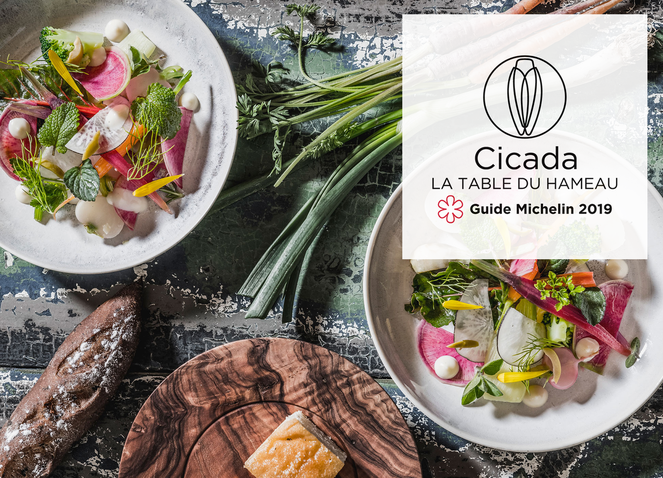 In addition to Cicada, the gourmet signature restaurant, the chef will also manage all the restaurants of the hotel: the new bistro and summer’s Camion Bleu, the Hameau’s infamous food truck. The bistro will highlight a simple yet delicious, home cooking, showcasing Mediterranean seasonal products. The focus is on a local, healthy, generous and delicious eating, underlining le Hameau’s will to promote healing and wellbeing as a whole. Cicada’s new menu pledges for a journey into emotions and discovery. “I look forward to novelty and magic. My approach to cooking is a feminine one: straight to the point, light and savory cuisine. A natural, healthy and floral cooking, which does not drown and knocks out all flavors”. What about the chef’s signature dish ? An exclusive product of course, perfected with high savoir-faire “Lobster with citrus, lacquered with a reduction of tangerine, yuzu, a dash of lime and extra fresh herbs such as burnet, coriander and lemongrass. I love punchy cooking. I look for freshness, bitter tastes, or crunchy textures.” A know-how he will use to cook for his peers, at Sirha, the annual convention for the restaurants and hotels industry, from January 26 to 30. During five days, with Enodis (provider of professional cooking equipment) as a sponsor, he will cook for renowned superchefs an exclusive gourmet experience, for a hundred guests daily.